Trap Jaw and Battle Cat weren’t the only things to sell out on Mattel’s last D-Day. 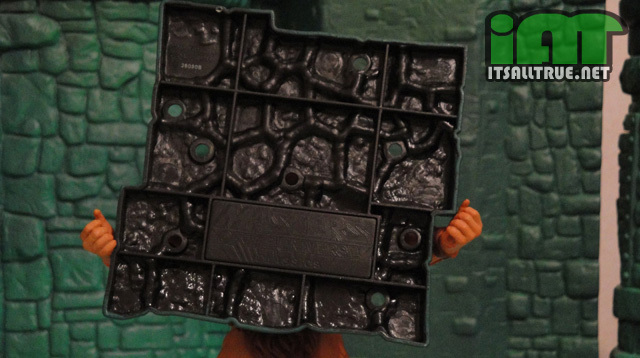 Even though it took a couple more hours than the other two, the MOTU “Castle Grayskull Diorama & Stands” also sold out. I imagine most people were thinking the same thing I was, “Battle Cat is a little expensive, so I might wait until next time to get those stands.” Well, at the last minute I caved and added a set to my cart, and I guess I’m glad I did so. Because if you decided to wait, you are probably a little annoyed at the recent comment by Toy Guru. We’ll look into “possibly” bringing them back, but for now we have no plans to do so. They were a bit of a one shot deal. I’m not really sure what those quotation marks around the word possibly mean. But even ignoring that, this is probably the dumbest statement anyone from Mattel has given at least in the last month. 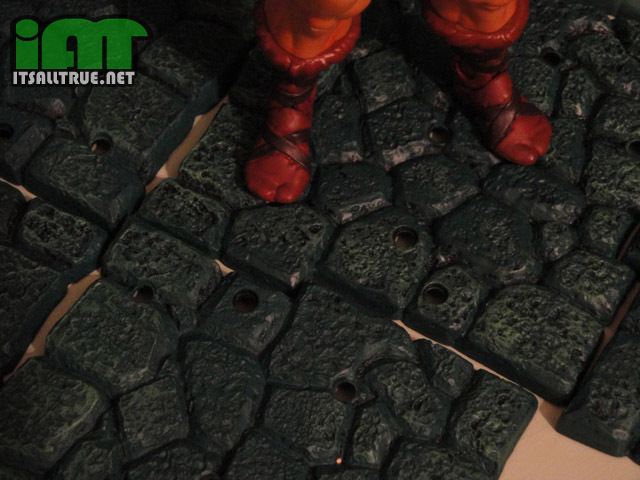 So here’s our review of these MOTU stands. I wasn’t sure if I wanted to do one at first, they are just stands after all. But after that statement, I felt like I should be showing people what they are getting screwed out of because of Mattel’s short sightedness. I can tell you right now, I’m not the biggest fan of action figure stands. I’m of the crowd that thinks my toys should be able to stand on their own. But, even so, I’m willing to admit when a stand goes above and beyond. I should have known these would be good, they are from the 4 Horsemen after all. In fact, the best thing about these stands is that they don’t even have to be stands. The first thing that struck me when I opened the box was just how big these bases were. They are way bigger than the pictures Matty has on their website. You can easily fit two MOTU figures on just one stand, which is pretty nice if you are trying to save on shelf space. (That’s something else I usually hate with stands, they take up too much room.) They even fit together with each other in a loose fashion to cut down on those empty areas between figures. I do wish they fit with each other a little more exact, but that’s something I can overlook since Eternia never struck me as a place to have a set Department of Transportation code on designing their streets. Something else that’s impressive is the detailing on the top. 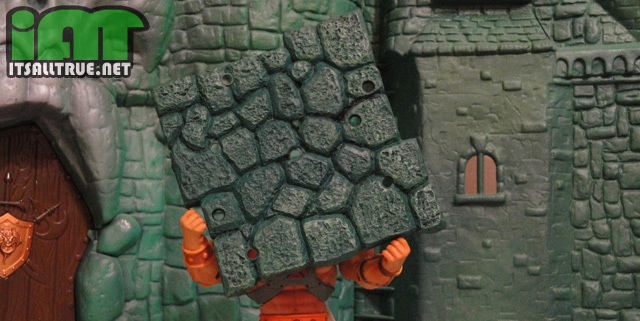 The fitted stone look matches Castle Grayskull well, even though the stands are slightly darker than both versions of Grayskull and the 200X Battle Station. 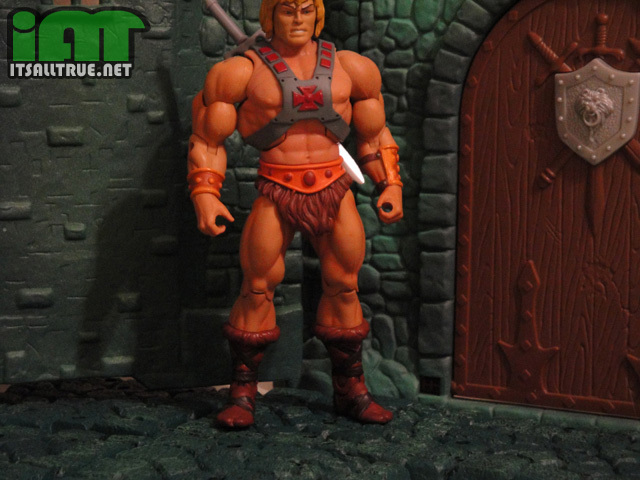 This makes me wonder, if they ever get to a Classics Castle Grayskull, will it be this darker shade of green? The bottom of the stands are entirely black, but they do have the Masters of the Universe logo on them, which is a nice touch. I would have bit on these had they been a bit cheaper, but now that I’ve heard they are only “possibly” coming back I don’t mind since I would have only bought enough for a few of my figures. Good to know that I can’t park my Land Shark at Castle Greyskull. I’ll have to figure out another way to deliver my flowers and Candygrams there. Dude, I don’t wanna see the kind of parking boot you’d need to secure a Landshark. I saw one for a Bashasaurus and it was a doozie. Wow, you actually made me want to get half a dozen boxes of these! It’s a pity that they are sold out. Urgh.